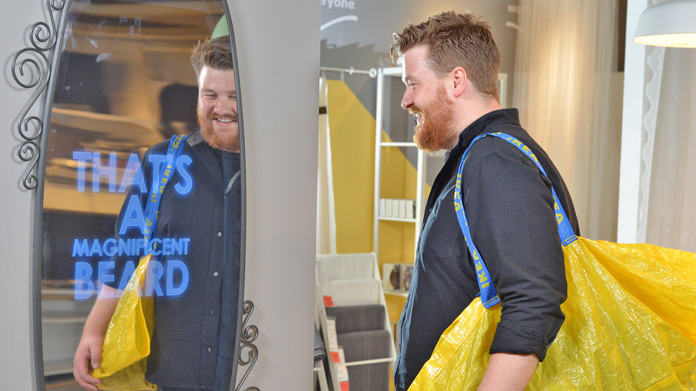 We’ve been working with IKEA on a cute little activity to support their current bedrooms marketing campaign – “where good days start and end”. To help people’s days start just that little bit better, we thought we could come up with an idea that would give them a little pep up each morning. And so it was that the “Motivational Mirror” was born. Using Kinect – for its motion sensing – and some pretty whizzy coding, the mirror delivers personalised compliments which are triggered as people pass. It then creates cunning little notes – in text and speech – to boost people’s days. They range from “you have a splendid beard” to “your eyes are mesmerising” to “wow, have you been working out?”. It was all built by the Hope&Glory team and our very good friends at Rewind. As IKEA themselves would say, starting the day positively, by having a good night’s sleep, quality time with loved ones, or a boost to our self-esteem, has knock-on effects that shape not only the mood of the individual, but that of the nation. The mirror went down a storm with the media. Coverage came rolling in as soon as the announcement was made. Daily Telegraph, METRO, HuffPo, The Times (which also delivered a half-page belter in the paper), ITV, MSN, Buzzfeed, (who even made some cute Vines for us), TrendHunter, PSFK and Design Taxi, amongst others. Oh, and then we went global with an absolute humdinger on ABC News stateside.